How can ASCA write a Working Description when there is no single working style of Aussie? No breed of stock dog can be categorized as having a "single working style". There will always be acceptable variations among individual dogs. However, each breed does have a recognizable set of traits that set it apart from other breeds. A working description can be broad enough to include all of the typical inherited traits of the Australian Shepherd, which are exhibited as the breed's "working style". There are many documented descriptions of the natural working style of the breed. Is there any trialing system that takes into account a certain set of breed specific style criteria? ASCA created its Stock Dog Program specifically to preserve the Aussie's natural inherited ability. All-breed trialing systems do not acknowledge breed-specific traits. Border collie trials are designed to reward the inherited traits of Border Collies. ASCA's trialing program may be unique, in that it was developed by single breed club to promote the working ability of that specific breed. Didn't ASCA get rid of "style" on the scoresheet so dogs would be judged only on whether they get the job done, not on how they "look" doing it? There were two objectives for the 1994 score sheet revision. The first was to simplify the scoring by taking out all the small "boxes" - each of which had to be assigned a numerical score. The second objective was the concern at the time that handlers were doing the work instead of the dog showing he could handle the stock, hence the terminology "Dog's Ability to Control Livestock." Will the Working Description turn the Stock Dog Trials into something like a conformation contest? No. Any competition that involves performance and livestock will always be influenced by stock, field/arena conditions, challenge or lack of challenge, and will be more subjective than judging appearance standing and moving. All purebreeds are result of crossbreeding, so what's wrong with bringing back more extreme traits that are more typical of some other breeds, which might have been lost over the years? The very reason for having purebred breeds is to maintain a predictable gene pool of traits that make one breed identifiable when compared to others. If one prefers the traits of another breed one can simply get a dog of that breed. There is no evidence that the traits that were present and desired in Australian Shepherds have been "lost" since ASCA began keeping a verified registry. ASCA has always had conscientious breeders of stock dogs, who have selected for the typical traits that make the Aussie uniquely valuable. If ASCA has a Working Description, what will keep it from forcing judges to take off style points in agility, obedience, and tracking? Will judges automatically penalize or NQ a dog if they know it comes from a certain line? Judges in any venue may not penalize or reward a dog because of its pedigree, handler, trainer, or owner. We trust all ASCA judges to abide by the spirit and the letter of the Program Rules and Judges Codes of Ethics. If a judge in any venue appears to be prejudiced for or against a particular bloodline, it is up to contestants to withhold entries from the judge. Will the Working Description stifle breeders of the future Aussie? A Working Description, like a Breed Standard, has no power to stifle breeders from their own interpretations and preferences. An ideal simply states the traits most desirable. Traits outside that description will of course occur and be weighed with the total dog. The typical is thus preserved even though individuals who are outside of typical may still compete successfully. Haven't there always been extremely strong-eyed Australian Shepherds? No. The Australian Shepherd was developed to be a "loose eyed breed of stockdog". This does not mean the Aussie never uses "eye". There have always been Australian Shepherds who work with some eye. The Aussie has historically been described as having loose to moderate eye. Some individual dogs have been noted for being "strong-eyed for an Aussie". However, the breed as a whole cannot accurately be described as "a strong-eyed breed". Is this whole thing "sour grapes" to get even with owners of dogs that are winning? Of course not. Many people who do not trial dogs firmly believe that ASCA should have a written description of the working style of the Australian Shepherd. Over the years, as some breeders have intensively selected toward more extreme traits, dogs have been noted at trials that deviate from what is readily recognized as "Aussie", both in their general appearance and in how they handle their stock (please click here to read documents from the early 1990s). The reaction of observers at stock dog trials is no different from a concern over lack of type when they see conformation show dogs who do not look like Aussies. A standard does not solve any problem alone, but it does describe what ASCA has a Bylaw responsibility to preserve. Isn't this all about wanting to penalize dogs from certain lines? If a dog from a specific line works like a breed other than an Aussie, it is going to be noted. If many dogs from a specific line exhibit traits more typical of another breed, it does become a concern to those who value the uniqueness of the Aussie, and strive to maintain the breed's integrity. The same reaction would be expected if a bloodline emerged that had long noses, wedge-shaped heads, small triangular eyes, high tulip ears and produced an unusual percentage of sables. Concern over breed preservation should not be confused with a desire to penalize. Can't any breed - even Dalmatians - be trained to work the way the Description says? That would depend on what the description says, and one has not been written yet. Just as our Breed Standard specifies some traits that are not limited to Aussies (scissors bite, straight legs, moderate turn of stifle, correct angulation, etc.) there will be some traits in the Working Description that can be applied to many other breeds. A well-written Description will emphasize traits that are inherited and cannot be reliably trained for. Can Australian Shepherds be trained to be strong-eyed and crouch a lot? The inherited loose-to-moderate amount of eye in an Aussie can be enhanced by training. An Aussie can be trained to appear to have "natural crouch" in certain situations by repeatedly downing him during training. This is not an inherited trait, but anticipation of the command. However, when the situation requires the dog to get out, do something and do it fast, the dog will rely on inherited reflexes and behaviors, and revert to what is naturally comfortable for him. In other words, a dog will automatically go to his "default behaviour" when the chips are down! Crouching and strong eye are NOT "default behaviour" for an Aussie. If Aussies can't beat Border Collies in trials, why not improve Aussies so they can win? The ASCA Stock Dog Program was not created to guarantee that Aussies always win top honors at our trials. It was created to preserve the natural working ability of our breed, and to improve the overall level of usefulness by helping breeders choose from dogs that exhibit the combination of desired traits unique to Aussies. If the only aim of Stock Dog Trial participants is to turn the Aussie into the greatest trial dog of all times, then intensively breeding for Border Collie traits, which are not typical of Aussies, might be considered a valid pursuit. If we still want the Australian Shepherd to continue to be the great to live with companion, guardian of the property and children and ideal farm/ranch dog, who will go all day whether working or not, then we need to preserve that which makes him an Aussie. Read an article about breed differences relating to temperament. Will ASCA have to write a Working Description for every breed of dog it allows to compete at ASCA Stock Dog Trials? ASCA has not stated, as an objective of the Stock Dog Program, the need to preserve the natural inherited working ability of every breed of dog. The ASCA Stockdog Program was explicitly created for the Australian Shepherd and the other breeds are welcomed guests in the ASCA program. ASCA Stockdog Judges are expected to have enough general knowledge of the differing traits among various breeds to judge them accordingly. However, every ASCA Stock Dog judge is required by ASCA to have trialed and worked Australian Shepherds. It is of the essence that judges understand the specific traits of our breed, in order to reward the best individual Aussies at any given trial. 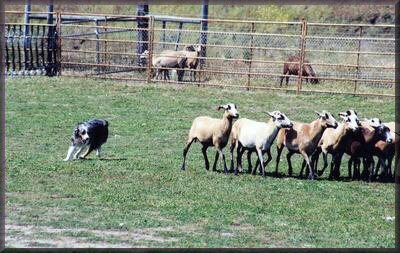 Won't a Working Description make it harder for Aussies to win trials against Border Collies? The Working Description will not make it easier or harder for Aussies to win trials against any other particular breed. The goal of the Working Description is to help preserve what is best in our Aussie stock dogs and improve the level of usefulness across the gene pool. It has no bearing on which dogs go High in Trial at a given show. How can judges know how all those other breeds are supposed to work? They don't need to. They never have had to do this and have no obligation to other breeds to protect or preserve their inherited working style. Several times over history it has been suggested that experienced stockdog trialers from other breeds be allowed to become ASCA Stockdog Judges. Each time it has been denied for one simple reason. The ASCA tockdog Program is for the Australian Shepherd. If ASCA only cared about "work accomplished"they would have allowed judges from other breeds into the program long ago. Shouldn't a working description or standard be part of the breed standard? What's wrong with putting physical descriptions of the breed into a working standard?